Transform your body in seconds with this professional body definer! 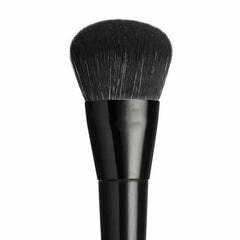 You can professionally contour your limbs with its specially formulated shape and easy-to-glide wand, the brush head moves smoothly along your bod, allowing you to define your figure. You can accentuate your abs, jawline and décolleté for a defined, polished look. The bristles are 100% animal-friendly with opulent fibers which replicate real animal fur. With this remarkable technology in synthetic hair, this brush is perfect for creating flawless and natural-looking contours. Used by makeup professionals and beauty bloggers alike, this premium body contouring brush is the ultimate tool for ladies who are serious about makeup art. 18 cm full length. Bristles - 3cm high, and 2cm wide.